The Consultants for Change pilot ran from 2016, with the first cohort completing the training programme at the end of 2017. In this paper, Rachel Hayman and Nigel Simister present findings from the final evaluation of the programme conducted in November and December 2017. What have been the changes in knowledge, awareness, practices and capacities of the participants? What were the benefits to CSOs in the programme countries? What are the longer-term prospects for change beyond the pilot programme? 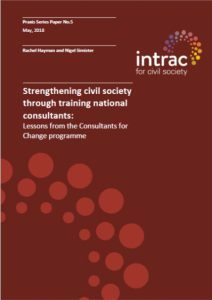 As INTRAC and NAMA each develop follow-up activities and spin-off initiatives from the pilot C4C programme, this paper offers valuable lessons-learned for strengthening the capacity of consultants who are dedicated to supporting civil society .